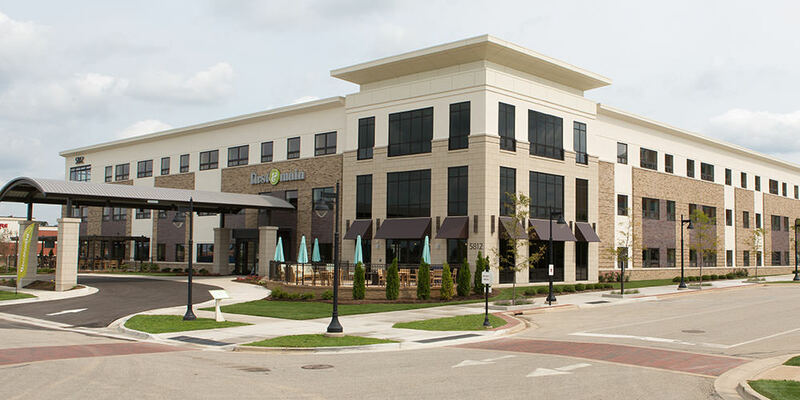 First & Main of Metro Health is a warm, upscale senior living complex in Wyoming, MI, where residents remain connected to each other and fully engaged in the things they enjoy with easy access to peaceful commons areas and vibrant social spaces. The three-story facility, located directly across from Metro Health Hospital, is licensed for 171 residents and contains 102 living suites. The first two floors offer private assisted-living suites while the third floor is dedicated to memory care residents. The facility was designed and constructed to emulate the energy and convenience of a walkable village square and includes an in-house chapel, theater, salon, bistro and patio, fitness center and a courtyard with a putting green, raised gardens and multiple seating areas. The exterior features brick, stone and metals similar to the neighboring structures that house healthcare, retail and hospitality facilities.